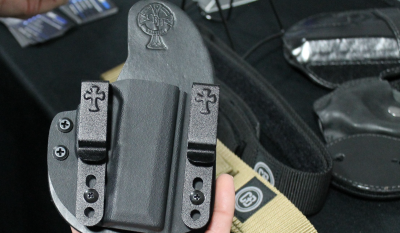 Crossbreed Holsters trotted out one updated and two new products at SHOT Show 2019. Only one is a holster. The Reckoning holster has been given a complete makeover. Once IWB-only, the holster is now convertible for outside-waistband use too. It also features adjustable retention and ride height. It retains the kydex outer/leather inner design. There’s currently no choice of width of the belt clips. The new Reckoning isn’t listed on the Crossbreed website yet. Left-handed models are available. It’s not clear if colors other than black will be available for the revised Reckoning. It’ll still go for the current price of $64.95 including belt clips. The kydex Accomplice magazine pouch has a low profile that should work well under a shirt or openly carried OWB, or wear it IWB. $39.95. Both the Reckoning and Accomplice require an extension to be added, vis two screws, to the devices in order to wear them OWB. The extensions are included with purchase. The Accomplice mag pouch and rigger’s belt. A Rigger’s Belt, one size only, is another upcoming product. It’s 1.75 inches wide and made of nylon webbing. The material is lighter and more flexible than most other tactical belts of the same name. The painted forged steel buckle appears very sturdy. Available colors will be desert tan and black. It’s anticipated the belts will be available by mid-2019. $34.95. These new choices by Crossbreed are likely reflective of the maturing product preferences of their customers. Holsters made easy to use both on the range or in concealment, a more flexible but solid belt, and even the thought of a carrying an extra mag are, to this writer/concealed carry instructor, an encouraging sign that more people are carrying daily and developing preferences for functional gear. The post SHOT Show 2019: Concealment gear from Crossbreed Holsters appeared first on OutdoorHub.